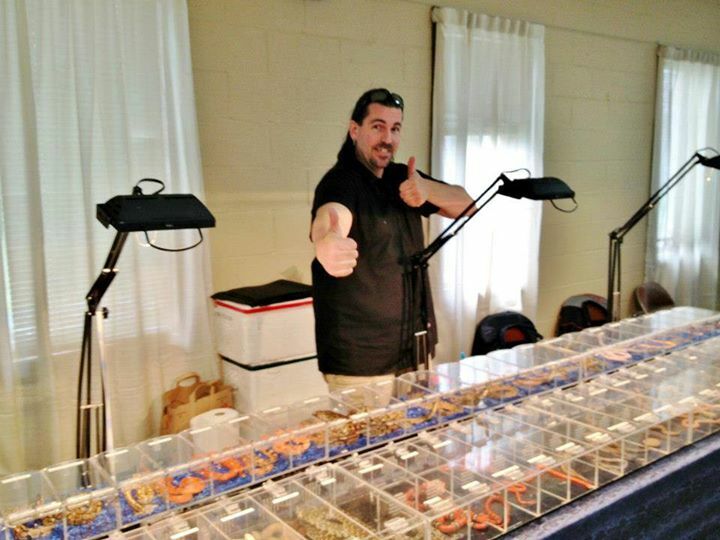 Timothy is one of our Venomous Vendors and we are very proud to have him highlight his collection at our shows monthly. Here is a little more about him. How Long have you been breeding / Collecting Reptiles? November 21st marked 27 years keeping serpents; December will mark 22 years breeding them. Why do you Breed / Own Reptiles? I own/breed for pure enjoyment, observational study and scientific contributions. Supplemental income is only secondary. ...and that’s about it for now, ha. What will you be bringing to the upcoming Pgh Reptile show? 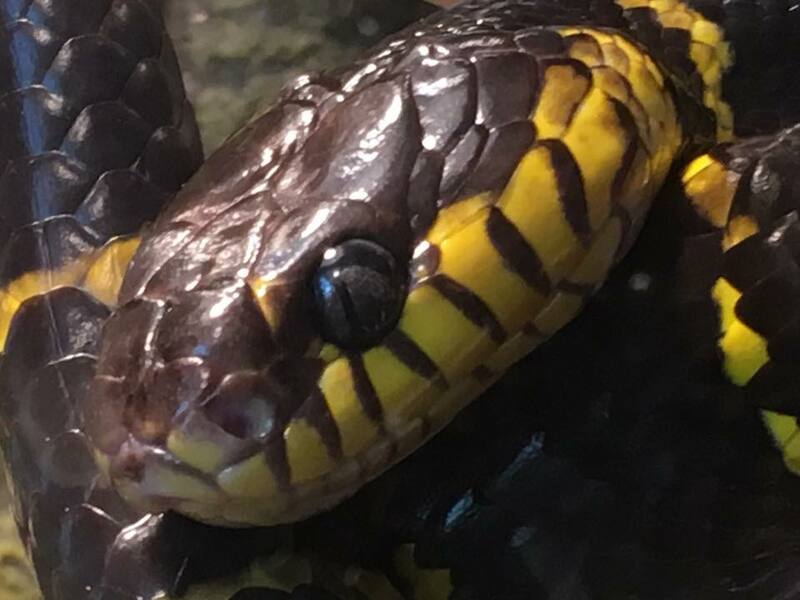 My favourite animal is of course the serpent, but if You mean in my collection...Man, that’s tough, but probably ‘Eversor’, my ~16-year-old 0.1 Boiga dendrophila dendrophila (Mangrove Snake) acquired over 14 years ago. ‘Rinky & Dinky’ and ‘Goldilocks & Pax’, however, my 1.1 Hemachatus haemachatus (Rinkhal’s Spitting Cobra) and 1.1 Naja nigricincta nigricincta (Western Barred, a.k.a. “Zebra” Spitting Cobra) respectively, have the most intriguing personalities and are very smart, inquisitive and voracious eaters that keep me on my toes! Specializing in rare, unusual and misunderstood families/genera/species, though, many of my animals are enlightening and sometimes take the cake for a day’s enjoyment, such as my Dasypeltis spp. (Egg-Eating Snakes) and my recently deceased ‘Trunks’ (1.0 Acrochordus javanicus [Javan Wart Snake]), R.I.P. 5/13/2011 - 11/4/2018. Anything else we might want to know about you? #1- How long have your owned / Breed Reptiles / Amphibians? I have owned and cared for reptiles and amphibians for over 25 years. My wife Ashley “married into the hobby” 9 years ago and has fallen in love with all of our “amphibi-kids”. I have been breeding for roughly 15 years. Starting with green anoles, moving into Fire Belly Toads, Green Tree Frogs, Whites Tree Frogs, Cuban Tree Frogs, and so on. Eventually progressing into Poison Dart Frogs (primarily), along with crested geckos and gargoyle geckos. #2. Why do you own / breed? We own and breed reptiles and amphibians, because we find them to be fascinating creatures. (If you ask my wife, it’s because I’m a Pisces.) I love researching anything and everything I can about all of them. Quite a few years ago we became interested in Bioactive animal care. We loved that we could mimic natural environments. This love led to the founding of Dendro Hollow. We now handcraft three custom Bioactive substrates for the most common habitats (Desert, Forest & Tropical) and sell all of the extras such as cleaner crew, plants, mosses, leaves etc. to really complete the build. It doesn’t matter how many times we produce a frog or a lizard, it’s just as exciting as the first time. It’s not a job to care for them and raise them, it truly is a passion. There’s an unbridled sense of satisfaction in properly housing a critter to the point that they will reproduce for you without forcing them to do so. This is due to the comfort and security that a naturalistic vivarium provides. We also believe that there are enough animals in captivity and no need to pull from the wild ( a.k.a. Field Collected animals.) So through breeding animals we are hoping to help reduce the number of animals harvested from the wild. We want our younger generations to be able to enjoy these beautiful creatures for many years to come. #3. What are your current breeding projects? Chines Cave Geckos (Goniurosaurus hainanensis), Russian Tortoises (Agrionemys horsfieldii), Tomato Frogs (Dyscophus guineti), and Leopard Geckos (Eublepharis macularius) of various morphs. Some of these are new territory for us, so we are thrilled to undertake this adventure. We will be showcasing our newest substrate, “Hollowed Ground Forest Blend” at the next show. This blend is suitable for ball pythons, cornsnakes, tegus, & a lot of inverts. Essentially anything in the mid humidity range ( 20% to 80% ). Our Ball Pythons have perfect sheds every time – proven! We will also have our “Hollowed Ground Desert Blend”. We have had this available for approximately 9 months. It is ideal for bearded dragons and other agamids, sand boas, leopard geckos, Russian tortoises, etc… Truly anything in the 40% and lower humidity range. I would like to address the IMPACTION concern I know everyone reading this will be concerned with. Impaction is not a substrate problem, it’s a proper husbandry problem! If you do not have proper temps, humidity, UVB (if neccesary), diet, and hydration, any animal will become impacted. If you have no substrate, and choose to use other cage liners, and the previous mentioned things aren’t at proper levels, you’re just prolonging the death of the animal or at the very least, creating a very unhealthy and unhappy animal. We literally tested our blends for well over 18 months each until we felt that we had perfected them. We tested for proper humidity retention, proper drainage, and proper plant growth. These recipes for the substrates are not new. They have been around for nearly 20 years in Europe. I was lucky enough to meet a foreign ally that aided me in perfecting our blends. He is a herpetologist, and has degrees in Botany, Biology, and Entomology. He has graced us with the base recipes and we built upon it to take them to the next level. There are only a handful of companies making these type of substrates in our country, and we are 1 of 2 doing the desert and forest substrates. I will tell anyone to “take the Pepsi Challenge” with our product vs. our competition. We encourage our customers to really analyze our competitions products and see if they think some ingredients are lacking. Lets just say our substrates have no less than 7 ingredients each! Sorry folks, it really is a secret family recipe! As always we are looking forward to seeing everyone at the next show! #4. What will you be bringing to the next Pittsburgh Reptile Show? 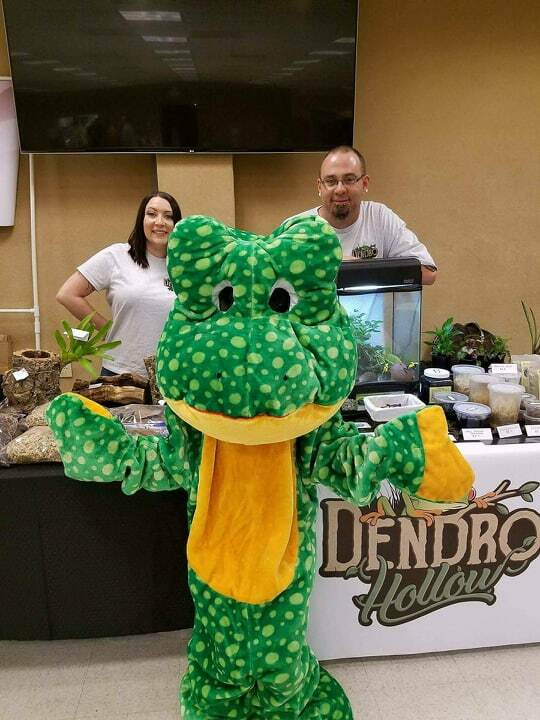 We will be bringing over 100 frogs, ( 5 different species of dart frogs, from a variety of locales), crested geckos, leopard geckos, whites tree frogs, chubby frogs, Argentine black and white tegu, and Pacman frogs. #5. What is your Favorite Animal? HMMM...favorite animal….I would have to say frogs in general are my favorite animal, which is why I chose them as my primary pet to breed. They are very vocal, more intelligent than most people realize, and very active and beautiful. 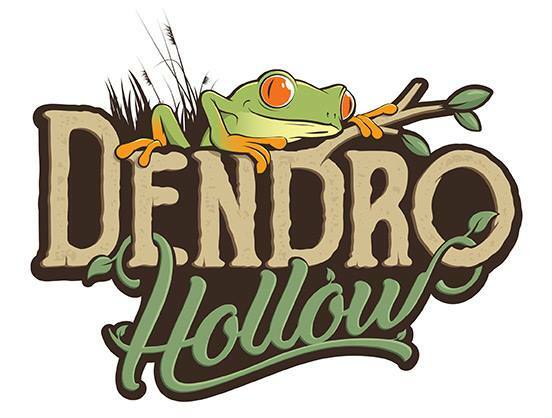 Tell me anything you think people want to know about Dendro Hollow? Some things I would like more people to know about myself, my wife, and our company Dendro Hollow. 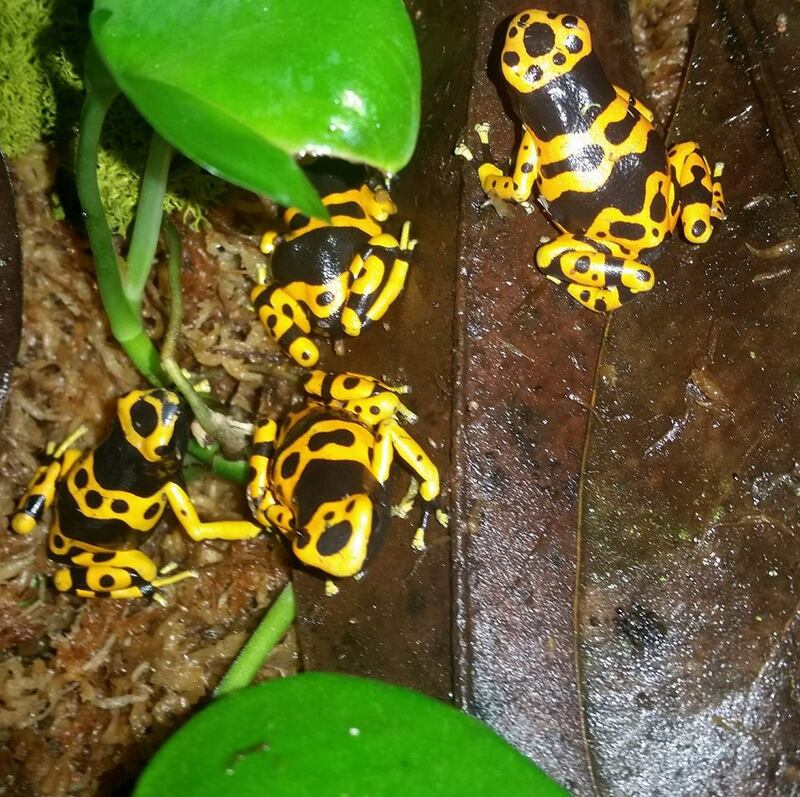 We specialize in Dart frogs and Bioactive , but most people don’t even know what that term means! It is fairly new to our area. Simply put, it means to set up a naturalistic vivarium that mimics the animals natural habitat. A mini-Ecosystem! You plant live plants in the substrate and add cleaner crew insects to the substrate, all of which cleans the tank for you. It’s self cleaning folks! You don’t have to rip the tank apart every few weeks and clean it, or replace the substrate. It is also completely healthy for the animal and brings out their natural instinct and behavior. There is no mold in the tank, no stink, no anaerobic bacteria to worry about, and no animal waste. We have dart frog vivarium’s that have been set up for years, never cleaned or ripped apart. They are as fresh and clean as the day they were built and the frogs are thriving. We have had our bearded dragons setup in desert Bioactive vivariums for years now with the same result. Over the time we have been in business, we have actually converted quite a few vendors over to bio and they love it. We have recently acquired a warehouse to begin producing our products on a larger scale and will be shipping nationally soon! Keep an eye out for our new website! We currently house over 200 animals not counting eggs, tadpoles, or babies. Tons of frogs, Russian tortoises, tegus, anoles, Cuban knight anoles, veiled chameleons, bearded dragons, gargoyle/leopard/crested/golden/Chinese cave/mourning geckos, ball pythons, Saharan sand boa, California king snake, tomato frogs, chubby frogs, whites tree frogs, red leg walking frogs, 33 species of dart frogs, 2 chihuahuas, and 1 cat. We are experienced pet owners and breeders, and love to educate others that may be new to this hobby! At the next Pittsburgh reptile show & sale we would like to encourage anyone interested to come chat with us and learn something new! We can help you save yourself a lot of time and money! Make sure to Stop by say Hi tell them you saw them on the Vendor Spotlight!